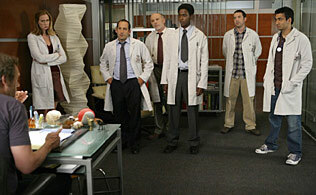 House MD Episodes: Season 4 #404 "Guardian Angels"
Fourth Season Episodes :: #404 "Guardian Angels"
Fellowship candidates (L-R) Amber (Anne Dudek), Taub (Peter Jacobson), Henry (Carmen Argenziano), Cole (Edi Gathegi), Brennan (Andy Comeau) and Kutner (Kal Penn) battle with House when they treat a woman who believes she can talk to the dead in the HOUSE episode "Guardian Angels" airing Tuesday, Oct. 23 (9:00-10:00 PM ET/PT) on FOX. 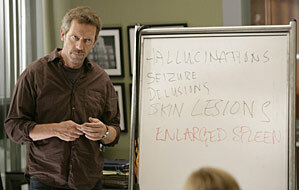 House (Hugh Laurie) directs the fellowship candidates when they take a case of a woman who has seizures and believes she can talk to the dead in the HOUSE episode "Guardian Angels" airing Tuesday, Oct. 23 (9:00-10:00 PM ET/PT) on FOX. 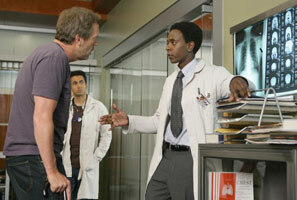 House (Hugh Laurie) butts heads with Cole (Edi Gathegi) when the fellowship group treats a woman who believes she can talk to the dead in the HOUSE episode "Guardian Angels" airing Tuesday, Oct. 23 (9-10PM ET/PT) on FOX. Also pictured: Kal Penn. Fellowship candidates (L-R) Taub (Peter Jacobson), Henry (Carmen Argenziano), Cole (Edi Gathegi) and Kutner (Kal Penn) battle with House when they treat a woman who believes she can talk to the dead in the HOUSE episode "Guardian Angels" airing Tuesday, Oct. 23 (9:00-10:00 PM ET/PT) on FOX.